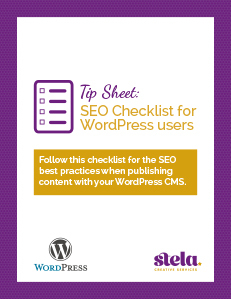 Follow this checklist for the SEO best practices when publishing content with your WordPress CMS. Managing your own website with WordPress is very convenient, but making sure you implement SEO best practices as you do it can be time consuming. To help small business owners be effective with the tools WordPress offers, we prepared this checklist that includes not only the must-have plugins, but also third-party tools that help business owners get the most out of their websites.